DURABLE MATERIAL RESISTS TEARING & FRAYING - Shade Cover is knitted wiht 180+ GSM breathable High Density Polyethylene(HDPE) material. UV Treated, Resistant to Mold & Mildew. UV PROTECTION UP TO 95% UV BLOCKAGE - Shade cover is UV stabilized to resist fading & mold while retaining material strength, keeping the heat out from the sun and attractive outdoor privacy where you need it. BREATHABLE WATER RESISTANT FABRIC - Allows fresh air passage & doesn't catch water, reducing temperatures underneath up to 25 degrees, perfect for D.I.Y. projects in the home, the garden or on the patios, pergolas, carports. 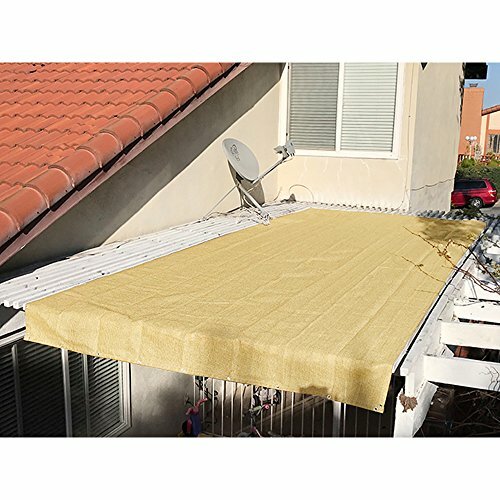 EASY INSTALLATION - Shade cover comes with hems and grommets every 2 feet all 4 sides, can be nailed, stapled, clipped... (No hardware included). CUSTOM SIZES AVAILABLE - Hassle-free customer service and free replacement, one-year limited warranty under normal use. More custom sizes and colors are available.